The hustle and bustle of Christmas Eve certainly preempted many from even considering a hike this December 24, yet four hikers joined Hike Leader Ken Moss at Albemarle High School (Pete & Bev Fink, Chris Kallenberg and Don Davis) On a bright, beautiful morning we headed to northern Albemarle County for the Chapter’s first-ever hike at Preddy Creek County Park, where we were joined by Briana Taylor and Wanda Hamlin. This was purposefully planned as a short hike (in fact, a “walk in the woods” would be a more apt description) so as to allow everyone plenty of time to get back to their pre-Christmas activities, while still allowing for a bit of fresh air and some good exercise. Intriguing topics of discussion along the way ranged from etymology to interesting habits of certain crustaceans, a discussion of avian courtship rituals and the identification of monogamous species in nature. At one point we stopped by an old homestead and were surprised to discover the extent of what was apparently an impressive estate in the distant past. After a pleasant 3.5 mile stroll and too short of a time together, we all remained in the parking lot chatting for a good 15 minutes before wishing each other a final Merry Christmas and parting our separate ways. Merry Christmas to all from PATC – Charlottesville Chapter! Three full cars with 12 hikers made the drive north to the surprisingly busy Old Rag parking lot. The weather was seasonable but overcast as hike leader Ken Moss took the group out onto Route 600 for the initial 0.8 mile walk up to the trailhead at the former parking lot. From there the initial assault on the summit began as we headed up through the forest on the first 1.6 miles of the Ridge Trail. Finally we made it to the begining of the rock scramble, where the fun really began. For Old Rag first-timers Briana Taylor and Chris Kallenberg this was a new experience, but they quickly adapted and, along with such Old Rag veterans as Marie Moss, Dave Borszich and Marian Styles, sported happy grins for much of the rest of the climb. Long-time PATC member Bill Holman admitted that it was his first time on Old Rag in more than 20 years! During a snack break on a sloping rock face with spectacular views of the Piedmont to the east, a discussion of the merits of larger pack sizes and resultant size comparisons soon degenerated into lively quips about one of the popular white elephant gifts from the previous week’s Christmas party…a bottle of wine from Well Hung Vineyards. Don Davis, as usual, kept people in stitches with some of his comments. After some good laughs we regained the rocky trail, continuing to climb up, over, under, around, and between various rock formations and boulders for 1.1 miles before finally reaching the summit. Teamwork was necessary at several locations to help others get through some difficult passages, adding to the camaraderie and fun. Eventually we reached the summit at an elevation of 3,284 feet where we spread out for a well deserved lunch with a view to the south. Everyone was pleased that John Shannon continued his tradition of bringing cake for the group, this time the ever popular Pumpkin cake with white icing…yum! After the lunch break we began the 1.9 mile descent along the Saddle Trail, winding downhill briskly before reaching Old Rag Shelter, where the group waited for Iva Gillet, David Ledbetter and Dan Ralston to return from placing Nepalese prayer flags near the summit (Iva and Dan having recently returned from a trip to Kathmandu and Anapurna). After regrouping, we continued down the Old Rag Fire Road to the junction with the Weakley Hollow Fire Road near the site of the former Old Rag Post Office. 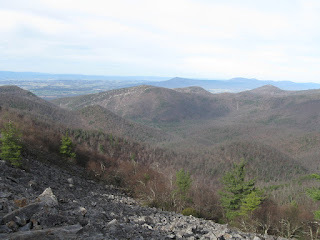 The Weakley Hollow Fire Road provided easy strolling for 2.5 miles before returning to the Ridge Trail trailhead, leaving only an easy and quick 0.8 mile walk along Route 600 before reaching the cars. It was a fun hike on one of our favorite mountains! The morning of the annual Chapter Christmas Party called for a short, close-by trek that would allow people plenty of time to to prepare for the evening's festivities while still being able to get out in nature, breath some fresh air, enjoy some beautiful scenery and get the blood pumping a bit. 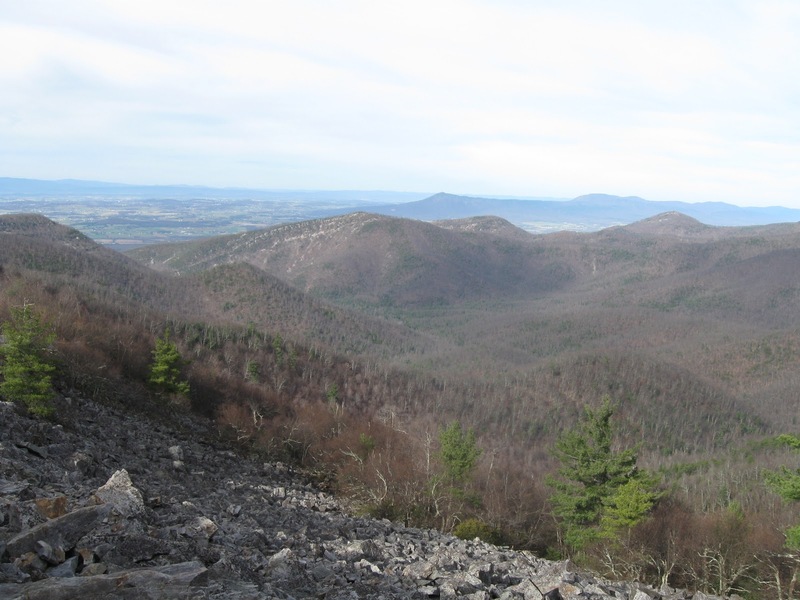 Nearby Ragged Mountain fit the bill perfectly and 12 other hikers joined Hike Leader Ken Moss at Albemarle High School on a brisk morning. With the short drive, we were on the trail by 9:30 AM, enjoying a pleasant 6.2 mile walk around the Charlottesville Reservoir in a counterclockwise direction. At about the halfway point, near the dam across the center of the lake, Iva Gillet produced a scrumptious pumpkin bread which hit the the groups collective spot. This was followed by a group photo on the dam before regaining the trail and completing our circuit at 12:30 PM. From that point everyone went their own directions to prepare for the evening's festive events. Joining Ken and Iva were Marie Moss, Maynard Davis, Andria Hoffman, Denis Grushaw, Chris Kallenberg, Bev Fink, Pete Fink, Dan Ralston, Marian Styles and Lindsay Brown. Food, camaraderie, and fun marked PATC – Charlottesville Chapter’s annual Christmas party. Like last year, Dunlodge provided the setting for about 40 attendees. Among those who helped decorate were Thomas & Mary Jorgensen and Don Davis, co-overseers of Dunlodge; Dan Ralston; Iva Gillet; Chris Kallenberg; Carol Tolbert; Keith Denson; and Todd Athey. Two Christmas trees, holiday music, and a warm, cozy fire lent just the right atmosphere to the festivities. People sated their hunger by sampling some of the many potluck dishes available. Don White’s spicy dill shrimp was a big hit, as were Iva’s avocado dip and Dan’s perfectly seasoned venison. Todd’s oatmeal-raisin cookies and John Shannon’s famous pavlova were among the many yummy desserts on hand. One of the nice things about having the party at Dunlodge is that it has allowed hiking folks to meet cabin folks, and vice versa. People were having such a fun time visiting that Thomas, looking quite festive in his holiday tie, had quite the task of gathering everyone together in the sunroom. Charlottesville Chapter President Lindsay Brown presented a certificate of appreciation to Don Davis for the many hours he has logged working at Dunlodge. Lindsay has ably served as president for the past 2 years, and no amount of cajoling or flattery could entice him into serving a second term. So Ken Moss, who has done a fabulous job establishing a chapter web site and blog, becomes president on January 1. These announcements led into the white-elephant gift exchange, which for many folks has been the highlight of our annual party. With the order of opening gifts determined by playing cards, Mary was the first to go. She unwrapped a lovely ceramic covered bowl, complete with an apple-cinnamon scented coaster. Following Mary, people could either open a gift or swipe one that had already been opened. If someone took your gift, you could either open a new one or pilfer another person’s gift, setting off a round of swaps. Watching the drama unfold as people jockeyed for the “good” gifts is always entertaining. One or two items usually prove the most popular, but this year, because so many people contributed new items rather than usable-but-used things, at least five items were highly sought. Four of those were alcohol: amaretto, corn whiskey, wine from Well Hung Vineyards (the label is quite the conversation piece), and a dessert wine. A box containing used items that was traded several times held a coffee-bean grinder, a vacuum container for coffee, a decorative hairclip, a fanny pack, and an earflap hat. The gift that drew the most laughter was the one that President-Elect Ken opened: a copy of the book Rogue President: The Presidency of Sarah Palin. At the end of the boisterous gift exchange, Mary got to trade her gift, at which point the game ended. A little history: The white elephant Christmas party dates back at least a dozen years. People who have been attending for many years await with trepidation and anticipation the opening of the one gift that is allowed—or rather, required—to be brought back the next year. “The Gift” is a portable urinal, which first made its appearance in 1998. Terry Nackley got it that year; she inscribed her name and brought it back the next year filled with candy. It has returned every year since then, duly inscribed with the name of each caretaker. This year, Anna Bielecki opened the infamous item. To allay your fears, the author can attest that “The Gift” has never been used for its intended purpose. Some people still harbor doubts, though, and their fears were stoked when Brian Muszynski sent “The Gift” to the 2006 party filled with a suspicious-looking yellow liquid and accompanied by an artfully shaped brownie. To sweeten the deal, Brian had included a $20 bill. The cash may have been what motivated John Brandt to trade for it. The 2006 party marked the first time ever that someone had actually traded for this iconic item—until now. During this year’s gift exchange, I had already stolen—and lost—the amaretto and the bottle of Well Hung wine. So during a round when most of the good items were off limits because they had already been traded, I took “The Gift” from a much-relieved Anna. Because so many of the club’s members have left over the years, and new members are unfamiliar with the significance and history of “The Gift,” I want to compile a history so the background of this special item is preserved. Make no mistake, though: “The Gift” will be the featured item at next year’s holiday party. I hope that you will be there. 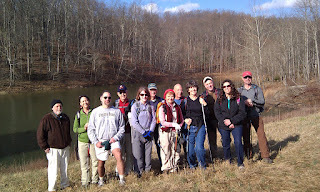 crisp day to hike the Rapidan Camp-Mill Prong-Laurel Prong-Hazeltoploop on December 3. 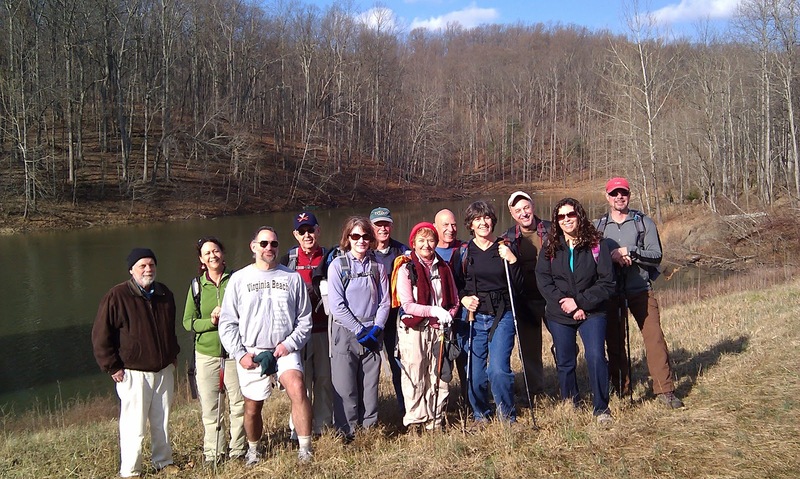 Fourteen hikers including Leon Gorman, David Ledbetter, Maynard Davis, Rita Kieffer, Ken Moss, Dave Borsszich, Don Davis, Andy Willgruber, Wanda Hamlin, John Shannon, Dan Ralston, Iva Gillet, and John Brandt were led by Marit Gay on the 7.3 mile trek from the Skyline Drive at Milam Gap. We descended the Mill Prong Trail following the stream down to the Rapidan Camp. The group toured the historical area and then ate lunch where three streams converge - Mill Prong, Laurel Prong, and Hemlock Run. After our meal we took the Laurel Prong Trail, crossing the stream a number a of times and then ascending back up the steep trail to eventually meet the Appalachian Trail going north. We continued to the summit of Hazeltop Ridge Overlook and enjoyed John Shannon's delicious cake on the rocks facing the Shenandoah Valley. An easy, gentle walk back to the parking lot made for a good ending to a wonderful day of hiking. a number of world treaties. On this lovely, clear fall day, we had 17 hikers for the trip which passed Skyland on the way to Stony Man, Little Stony Man and expansive views west to the Shenandoah Valley. Dennis and Mary Burgart joined us for the first time and were able to hike with veteran hikers John Shannon, Ken Moss, and Marian Styles. We began by heading toward Skyland, past the horse stables, where Tricia Neuman, a riding teacher at Little Keswick School, inspected the facilities, and chatted with members of the staff. We proceeded upwards, toward our lunch destination at the top of Stony Man. There were a few other people out enjoying the sunny day as we ascended to the second highest summit in the Park. Lunch at the top was impressive- vast views of the Valley to the west and lots of sun. We shared spiced pumpkin bread and John’s famous chocolate raspberry cake. Crystal Lantz, Tim Breedlove, Dianne Anderson, and Patrick Wright talked to fellow hikers Dennis Templeton, Dan Funkhouser, Dan Ralston, Don Davis, and Eric Christensen. After lunch we descended to the rock climbing cliffs at Little Stony Man and could see ropes and little people, who had descended safely to the bottom. As we proceeded north, we were treated to relatively unobstructed views of the Valley on a clear fall day. We wandered around the picnic area at the Pinnacles and finished our hike in time to run a shuttle at the end, as it cooled off with the sun ducking behind the mountains. It was one of those days that makes one realize how lucky we are to live in central Virginia and hike in the Blue Ridge Mountains. This was the day for those who thought they needed to get out and move after Thanksgiving, and did not want to play the contact sport of just-after-Thanksgiving shopping, or think that watching a football game is exercise. Arriving at Madison Run, we found several horse trailers already parked there. We walked a short distance up the fire road, then started the climb up Furnace Mountain. The forecast mild weather meant some stops to remove layers. At the junction with Furnace Mt. spur trail, Mary Taylor and Rita Kieffer decided to head out to the summit to make a shorter hike than the full 8.5-mile route. Following Hike Leader John Shannon for the full distance were Sue Tansey, Dan Funkhouser, Wanda Hamlin, Dave Borszich, Marian Styles, and Michael Seth. On the section of Trayfoot Mountain Trail leading to Blackrock, John tried to protect a little piece of America from foreign enemies by cutting some tree-killing, imported bittersweet. At Blackrock, numerous people and dogs were enjoying the weather and scenery, some climbing to the top of the rocks. We ate lunch—which included healthy, or at least great-tasting, orange cranberry cake—on the side of the trail. The view on this crystal-clear day was spectacular. Our interminable descent was uneventful, except hearing the Downhill Diva proclaim that she was ready for the downhill to end. After waiting for horses to enter their trailers, we headed back to Charlottesville, blissfully unaware of the shutout unfolding at the UVA-Virginia Tech football game. Seven hikers met hike leader Ken Moss at Albemarle High School on what turned out to be a cool, but not cold, day with clear skies. Pat Skelly made his second hike with us, while regulars Rita Kieffer, Dan Funkhouser, Marian Styles, John Shannon, Perte Fink and Marie Moss also attended. We were soon on the road in two cars heading toward George Washington National Forest's Sherando Lake Recreation Area in the Pedlar Ranger District jsut south of Waynesboro. Surprised to find the main gate to the Recreation Area still open, we drove to the base of the Upper Lake before disembarking from the cars to begin our hike up the White Rock Gap Trail. It was a bit breezy as we started the hike, but by the time we got into the woodline things calmed down for the rest of the day. After a steady, moderate climb we reached a junction with the Slacks Trail, which we took for the steepest part of the day's climb...though this section didn't feel nearly as tough as it had been in the heat of the summer (see Torry Ridge and Sherando Lake - July 30, 2011). Upon reaching the junction with the Torry Ridge Trail we stopped for lunch, where teveryone enjoyed John's famous pumpkin bread. Afterward we started the return northward toward Sherando Lake along the crest of Torry Ridge, with views thanks to the bare branches of late Autumn. We then headed down the Blue Loop Trail, pausing for a rest and to admire the views of the lake from a rocky overlook. After a steep descent, we circled back on the Lakeside trail to the picnic area before wrapping things up with a walk through the campground to reach our cars. A majority of the participants chose to seek food and refreshments on the return drive with a stop by Blue Mountain Brewery...a perfect ending to a perfect day! A near perfect day greeted Hike leader Lindsay Brown and a group of 11 for a hike from Reeds Gap to Cedar Cliffs and return. It was fairly cold at the start but quickly warmed up with the sunshine along the ridge. Hikers included Maynard and Joanne Davis, Sue Tansey, Dan Funkhouser, Pete Fink, Pat Skelly, John Shannon, Dave Borszich, Marian Styles and Andy Wilgruber. We had lunch on the Cliffs with a great view of the Valley. While there we encountered a hunter. When we asked about the hunting season start he informed us that the "regular season" had not yet started, but it was Muzzle-Loader Season. John Shannon's observation on hunting season was that "it seems you can always kill something with something in Virginia."